It’s been five years since I was in a parish with a school. 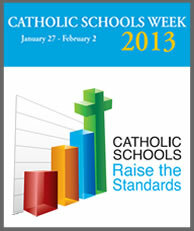 So I feel far-removed from the concerns and culture of Catholic schools. Many parishioners resent the drain of resources for an effort that teaches religion or has direct activities in the faith just a percentage of the time–maybe 20%; maybe only 5. Archbishop Wuerl spoke of the institutional and financial challenges here. Elements of faith, not so much. I would like to offer one personal experience, and one concern I don’t see often addressed. The pipe organ began playing and it seemed as if a cloud, a spiritual cloud was descending on us kids. I felt surrounded by the music. The priest read the Bible. And he talked about it. My Protestant mother had a few Bibles around the house, but she never talked about them. Later on, I noticed that the kids up front were on the move. I asked my friend what was going on now. “Communion,” he said. An irregular and unorthodox First Communion, to be sure. But a product of a Catholic school experience: the care taken for the liturgy, including music. The kindly welcome of a new friend who must have thought I was from another Catholic school in the city. I was the first non-Catholic student in my grade. One challenge of Catholic schools is that in the absence of a stronger Catholic culture, they tend to overwhelm the parish experience for kids and parents alike. It’s not that schools drain parish resources, as I’ve heard the complaint. It’s that the focus on academic achievement (high schools are more prep than Catholic), athletic accomplishment, and youth culture thirty to eighty hours a week tolerate no competition. And let’s face it: the two-hour-a-week parish cannot hope to triumph over the major time commitment of adolescents and the focus of many of their parents. So, to my friends in education: have a happy week. We have a lot of good things going on, both in your sphere and in mine. Let’s hope we can find some way to work together and pull for a common goal. This entry was posted in Church News, Ministry, spirituality and tagged Archbishop Wuerl, Catholic culture, Catholic schools, parish life. Bookmark the permalink.